Two locking bars are of steel tube with forged handles, anti-racking rings and cam ends,and fixed to each leaf with bolts/nuts ,by top and bottom bearing brackets and one bar guide bracket. The bars are suspended in bearing brackets with bush of self-lubricating synthetic material. The turn direction of the locking handles will be single direction for each door. 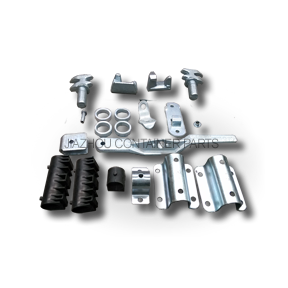 Locking device type : Sae Jin or Bloxwich products.